This page contains my most favorite Lady Gouldian finches photos as well as additional photographs that I have found or that have been sent to me. I have shared my tips for taking clear Lady Gouldian finch photos at the bottom of this page, so I hope that can help you to get better photo results of your birds. Please share your own Lady Gouldian finch photos with me by adding pictures that you have taken to this page and telling me about them and yourself. Tell me where you live in the world and why it is that you chose Lady Gouldians to learn about and keep. I would love to see your birds as well as their living arrangements. Having observed a great variety of creatively constructed individual cages and aviaries, I welcome your unique ideas and pictures of them as well. Add yours here by simply uploading your picture (must be less than 100k and only .jpg and .gif formats can be uploaded at this time) and typing a note sharing some information with us about your picture. This is just gorgeous in my opinion! I think this is one of the best close up photos around of a red face lady gouldian finch - what do you think? all these are bred goulds my aviary Thanks again! Lovely birds! I found trying to take good quality Lady Gouldian finch photos to be very difficult. The birds move too fast and too frequently. The cage wire is not attractive and gets in the way. The lighting is inadequate. Just trying to hold the camera close enough and still enough to get the shot is difficult. It seems the birds are either above your eyelevel or below it. Getting into a comfortable and optimal position can seem impossible. I have however found a way to get around these obstacles and take good Gouldian finch photos. It came to me one day when I was returning home from a bird show. You will need to acquire or build a wooden or plastic standard finch show cage, a few thin pieces of plexiglass, clear tape and heavy scissors or a utility knife to cut the plexiglass. The show cage door will be on one end of the cage rather than on the front and there will be only one short perch inside the box so there really is no reason for your finch to hop around. Remove the cage wire. Cut and tape the plexiglass pieces to fit in the same places as the wire had been. 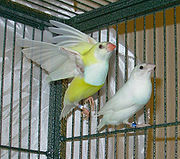 These cages also have a painted interior that is uniformly a pale blue. It will make a nice background. Be sure you pick a location for your photographing that is either at your eyelevel or slightly above it. You don’t want your Lady Gouldian to be twisting around awkwardly trying to see what it is that you are doing when you want a normal pose. Now put your lady Gouldian in the box and click away. Share your Gouldian Finch Videos here too! If you have a video of your birds in action or their homes, that you would like us to feature here, just post the video ‘embed’ code in the submission text box above and you will soon be able to see it live from this page. Enjoy these wonderful You Tube videos! There are more wonderful videos on the other pages on the site – Enjoy!